**Mr. or Miss Pumpkin w/personalized name Trick or Treat Bag - ONLY $16.60 SHIPPED!! ** | Free Tastes Good! 2016 Sunday Coupon Insert Schedule! **OUTREACH OPPORTUNITY** FREE Community CHRISTmas Dinner – Sunday, December 16 from 4-5 p.m.
**GET YOUR LAUNDRY DONE FOR FREE** FREE Community Laundry Day – Saturday, April 28th from 10 to 12:30 PM!! How to Organize a FREE Laundry Day! I love these personalized items and we go to a trick or trunk type event at a church in our area. I ORDERED 2 LAST YEAR AND LOVE THEM:) The Trunk or Treat is an alternative to Halloween, but the kids get to enjoy a cool Fall Festival – This is a pretty sweet deal!! The sweetest part is they embroider your name for FREE!! 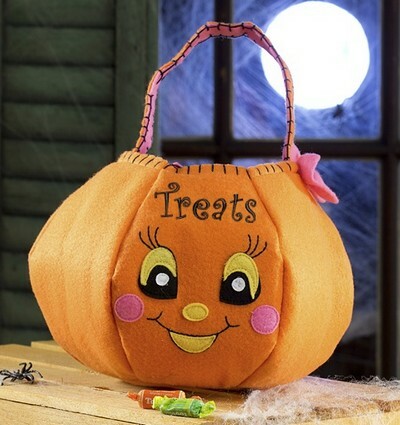 Get your Miss Pumpkin Trick or Treat Bag by CLICKING HERE for only $16.60. Once signed in, click on “SHOPS” THEN “halloween” section and this will pull right up:) At Check out use coupon code “halloween” to score an extra 10%. Total including shipping is $16.60!! There’s no trick to figuring out who owns these goodies, stashed in their very own personalized Embroidered 3-D Trick-or-Treat Bag! We custom embroider the name of your little “ghoul” in the curly font style shown in coordinating pink thread, claiming complete ownership of the bounty of treats inside! Whimsical and fun design features a smiling girl pumpkin with a pretty pink bow and dangling candy corn accents, ready to stash their treats from house to house. Design features 3-D intricate appliqué and embroidered detail, making the bag stand out from all the rest! Quality constructed from 100% durable felt fabric, each panel filled with polyester batting. Features contrast stitching on the handle & top edge opening and reinforced handles at stress points to handle their heavy collection year after year. Measures a generous 8″H x 12″ in diameter to handle small or larger loads. 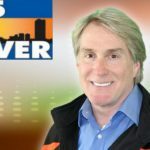 Deals of the Week on 101.5 The River Toledo with Rick!! 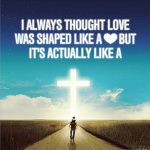 April Daily Devotion ~ 4/4!! 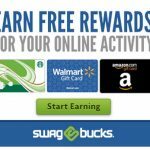 JOIN SWAGBUCKS ~ Sign Up and Earn Extra Cash – It’s EASY!! 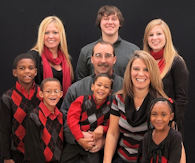 My name is Joni Meyer-Crothers and I run this couponing/money-saving blog along with my husband, Jamie. We love to show others how to save money in a BIG way! We do all the work for you. . we do the matchups and show you where to get the coupons, many FREE printable coupons. Sit back and follow the blog and watch your savings increase! 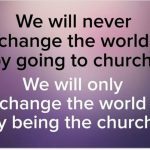 Couponing is a ministry for our family as we we love to show others how to save and share from their couponing harvest! I just recently wrote a book called “Extreme Couponing” (released March 5, 2013) that gives step-by-step directions on how to coupon. 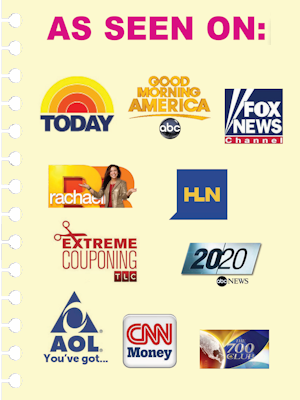 We have been featured on TLC “Extreme Couponing” five times, The 700 Club, 20/20, Today Show, GMA, HLN, Rachael Ray, AOL “You’ve Got”, Fox News, CNN Money, Huffington Post ~ to see a complete list you can click on the right-hand sidebar and the clips and articles are listed there. I continue to challenge everyone weekly to donate 5 nonperishable or hygienic items to a local food bank/pantry and/or family you may know in need. Don’t ever discount the smallness of any act of kindness. . it matters! Copyright 2019, Free Tastes Good!. All Rights Reserved.